Students must arrive with a pass from their teacher and sign in immediately. Quiet talking and silent use of mobile devices only. Downstairs table and computers are reserved for classes or group work. Before school at 7:15 a.m. until the homeroom bell. During study hall or a class with permission and a pass from the teacher. After school until the library closes (hours vary). Books and magazines can be borrowed with a student ID number. Students can check out up to 6 books at a time. Materials can be checked out for a period of 3 weeks and renewed indefinitely (unless someone else is waiting for the item). E-books can be checked out online in Destiny and are automatically returned after 3 weeks unless renewed. Lost books: please see the library staff for the cost of the book or to discuss a suitable replacement. ​Students are expected to use the library computers, copiers, and other devices in accordance with the district's acceptable use policy. Please see a library staff member for assistance with your Chromebook, the copiers, and laminator. Search more than 35 Gale research databases at once -- history, news, business, science, and more. Click here to see the complete list of Gale databases. 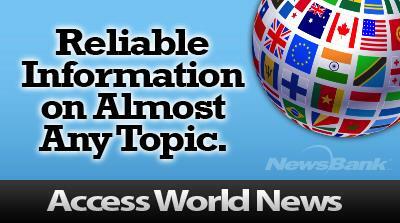 Search articles and reports from thousands of international news sources updated daily. Search JSTOR for articles from academic journals and chapters from ebooks. NoodleTools is an online research platform that allows you to collect and cite sources; create notecards, an outline, and a research paper; and share your components with students and teachers. Click here for the student login and click here for the teacher login. In a hurry? Cite a source quickly without logging into Noodle Tools and creating a project. Use the search box below to search 10 different websites that offer free professional photographs and images to use for educational purposes.